What is K nearest neighbors(KNN)? KNN is one of the simplest machine learning algorithm and it is a lazy algorithm, as it doesn’t run computations on a data set until you give it a new data point you are trying to test. In this tutorial, I will not only show you how to implement k-Nearest Neighbors in Python (SciKit-Learn), but also I will investigate the influence of higher dimensional spaces on the classification. The implementation will be specific for a classification problem and will be demonstrated using the digits data set. How K Nearest Neighbors Work? Lets say you have several apples and oranges and you have an unclassified fruit. If K value is 3, the algorithm looks at the 3 nearest neighbors of the unknown fruit and classify the unknown fruit as orange(as there are two oranges and one apple). If K is 5, the algorithm looks at the 5 nearest neighbors and classify the unknown fruit as apple( 3 apples and 2 oranges). KNN classifies an unknown item based on the concept of majority votes. Each neighbor can either be given an equal weight or the vote can be based on the distance. The similarity measure is dependent on the type of data, for real-valued data, the Euclidean distance can be used; For other types of data such as categorical or binary data, hamming distance can be used. Since there is a minimum training involved, there is a high computational cost associated with testing a new data. I recommend you to read Saravanan’s blog to know more about KNN. 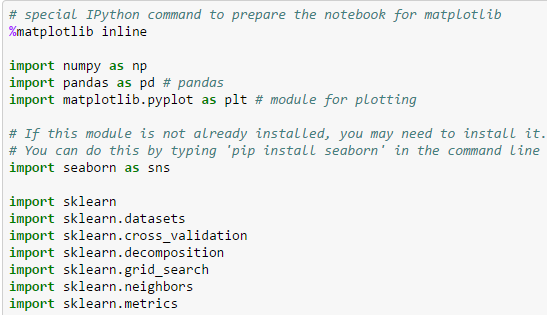 First I import all the required Python libraries to my Ipython Notebook. Seaborn is a Python library for making attractive statistical graphs, it is built on top of matplotlib. sklearn.datasets is used to import default data sets present in scikit-learn. sklearn.cross validation is used to perform cross validation on your data set, and sklearn.grid_search is used to select the best parameter K. If you don’t know what is meant by parameter selection and cross validation, please watch week 6 videos of coursera’s machine learning course. I will explain aboutsklearn.decomposition and sklearn.metrics later in this post. I then load the digits data set and store these data and target values in X and Y variables. My X value has 1797 rows and 64 columns, and Y value has 1797 rows and one column. You can print digits.DESCR to know more about this data set. I Split the data set into train and test set, in which I use 33% of the samples as my test data. I then mean normalize X_train and X_test. 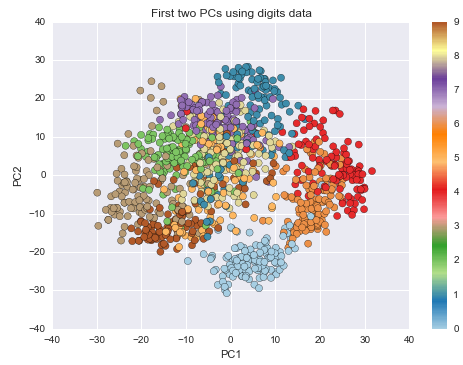 I create a scatter plot of the projections to the first two Prinicpal components. You can see here that I use sklearn.decomposition.TruncatedSVD function to reduce the number of components. It performs linear dimensionality reduction very similar to PCA, but operates directly on sample vectors, instead on co variance matrix. I am going to do a ten-fold cross validation to estimate the best K value. Apart from estimating the best K value, I am also interested in the influence of number of dimensions I project the data down. This means that, I am going to optimize K for different dimensional projections of the data. You dont have to panic by seeing the above mentioned code, I will explain the code line by line. In our implementation of knearest section, I set different values for K( from 1 to 20). Then I put these K values into a dictionary because GridSearchCvaccepts parameter values only as a dictionary. In the next line of this code, I call my nearest neighbors classifier from scikit-learn,knearest = sklearn.neighbors.KNeighborsClassifier(). Dont get confused as I introduced Iris data set here. In this section I am going to explain what GridSearchCV does using Iris data set. First I will load iris data set and then perform a train test split. If you are really curious to know about random_state, read this stack over flow thread here. Then I fit nearest neighbors to my dataset. clf = sklearn.grid_search.GridSearchCV(knn, parameters, cv =10), here I pass my nearest neighbors classifier, parameters and cross validation value to GridSearchCV. Even if you dont understand what cross validation or what GridSeachCV does, dont worry about it, it just selects the best parameter K for you. This is all you have to know about GridSearchCv. You can see GridSearchCv does all the hardwork for you and returns the best k parameter. First I create two empty lists and a list containing numbers from 1 to 10. I then loop over my no_of_dimensions using a for loop(for d in no_of_dimensions). Then I fit svd to my training data(X_train) and apply transform method to my test data. 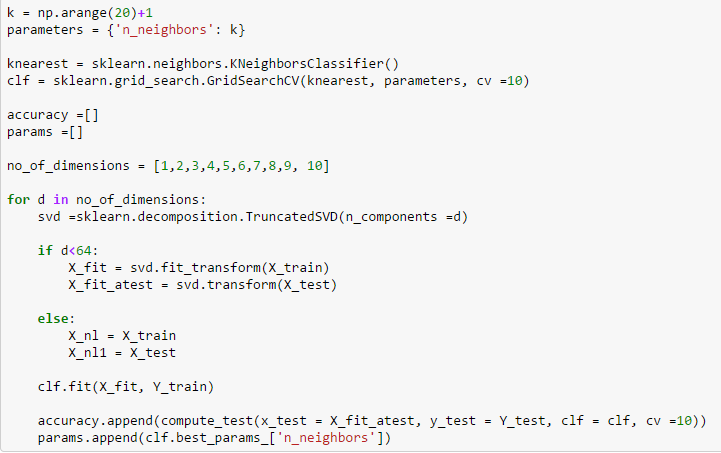 Now I fit my classifier to the truncated X_fit and Y_train. When you are fitting your classifier to your data set, remember to use X_fit instead of X_train. In this line of code “accuracy.append(compute_test(x_test = X_fit_atest, y_test = Y_test, clf = clf, cv =10))” I compute the accuracy score for every dimension using compute_test function. In compute test function, sklearn.cross_validation.KFold gives the indices to do a 10 fold cross validation split. I then calculate the accuracy score for X_fit_atest andY_test. The accuracy gets better as the dimensions increase. I have enough data points that the curse of dimensionality does not harm my predictions here and the additional dimensions add to the class separability. Hope this post has given a good idea of how k nearest neighbors operates, and how dimensions of the data affect your classification accuracy. © 2016 Big Data Examiner, All Rights Reserved.